Shisaku: Oh, The Persons You Will Talk To! 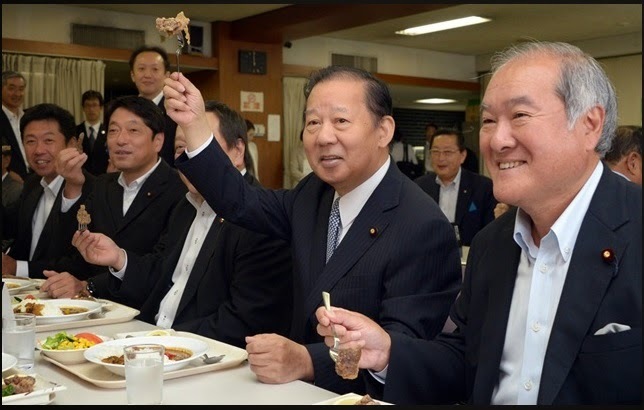 This was the scene in the Liberal Democratic Party cafeteria on Friday, the first of the "Whale Meat Fridays" demanded by General Council Chair Nikai Toshihiro and other scientific pelagic whaling-supporting party members. In the center is Nikai, a representative of the Wakayama district that has in it the infamous town of Taiji, where the residents conduct coastal harvests of dolphins, porpoises and small whales not covered by the International Whaling Commission ban. He is holding aloft a hunk of sei whale (iwashi kujira - Balaenoptera borealis) a species which can only be harvest on the deep ocean. The meat has been deep fried Tatsuta style -- one of the two ways whale was being served on Friday (the other was in a whale meat curry). Former Defense Minister Onodera Itsunori (Miyagi, another whaling prefecture) is among the other politicians visible preparing to have their Sei. Friday's very public eating of Sei whale conflates and confuses coastal whaling, which is traditional for communities with very little flat, arable land like Taiji or Chiba Prefecture's Wadaura -- and which I support -- and industrial pelagic whaling, which has no traditional basis and is a ward of the government -- a point conceded in the Yomiuri Shimbun's pro-pelagic whaling editorial of yesterday (Link). Because it is my nature to never leave any dishonest and poorly thought out thing well enough alone, I decided to have a bit of fun on Twitter at the expense of Nikai -- whom I like immensely -- and the other politicians pictured. A cheap shot, perhaps. However, given the absurd bravura of Nikai's lofting of his whale-laden fork, a not entirely inappropriate cuffing of the chin, metaphorically. Well, since having loosed the above, you can imagine the number and variety of folks of all persuasions have been blessing me with their opinions. Or perhaps you cannot. Anyway, it has been a lot of folks, some of whom did not see the humor intended. Great post! I am a longtime lurker and first time commenter. I do agree that there is a distinction between traditional practices and industrial government subsidized endeavors. I feel as though the publicity opportunity above somewhat echoes the lame "freedom fries" puffery that the U.S. congress performed after France declared opposition to the Iraq war.Who knew politicians were this silly? ?